BOZEMAN, Mont. 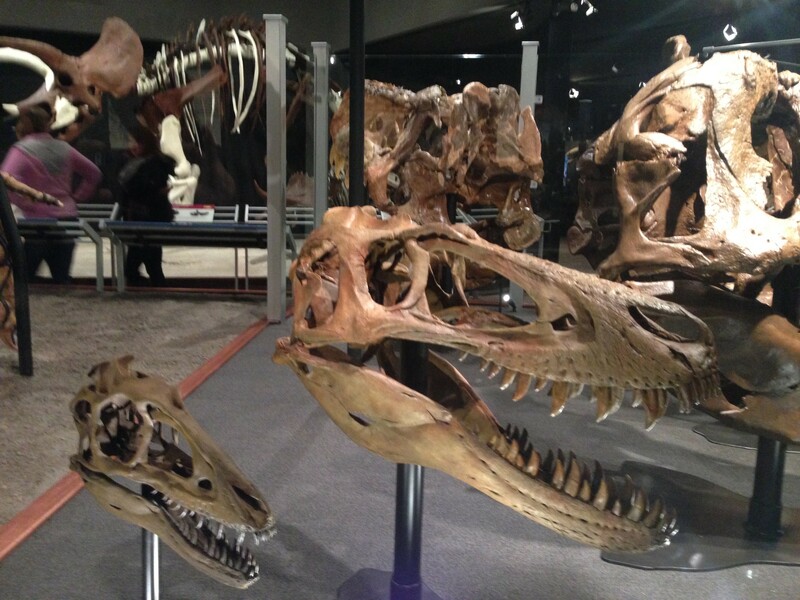 - On April 11, Montana State University's, Museum of the Rockies publicly opened a new permanent exhibit in its Siebel Dinosaur Complex called "The Tyrant Kings." 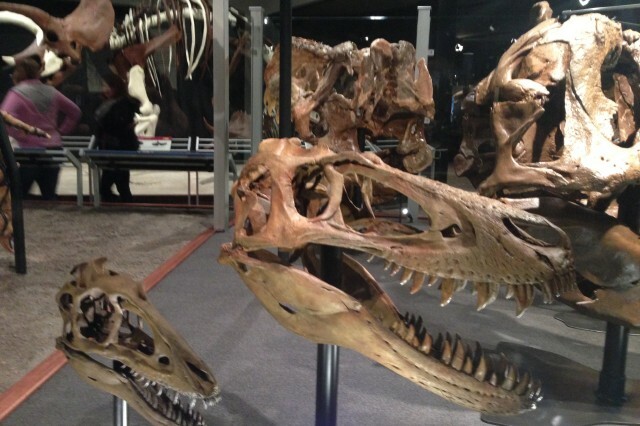 At the center of the exhibit is a nearly 12-foot-tall, 40-foot-long fossilized Tyrannosaurus rex skeleton. The fossil is known by many names: formally "Peck's Rex" because it was found in 1997 near Fort Peck Dam and Reservoir in Montana and scientifically, "MOR 980" the specimen number assigned to the fossil when the U.S. Army Corps of Engineers entrusted it to the Museum of the Rockies in 1998. 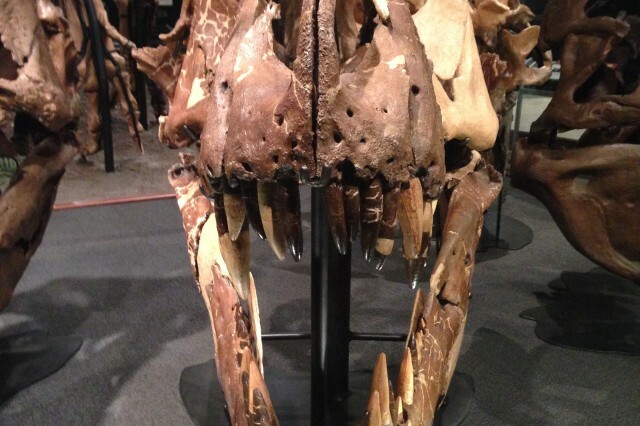 With the opening of the exhibit, the museum will refer to it as "Montana's T.rex." "The exhibit not only fulfills a promise made by [the Museum of the Rockies] to all of Montana, but also the mission of [the museum] to inspire life-long learning and advance knowledge through collections, research and discovery," said Shelley McKamey, Executive Director for the Museum of the Rockies. When discoveries including historical and archeological relics and specimens such as "Peck's Rex" and the "Wankel T. rex" are found on federal lands, federal repository agreements allow museums such as the Museum of the Rockies to allow fossils or historical artifacts to be placed within collections where they can be shared with the public and studied, evaluated, protected and preserved. Through these agreements, Peck's Rex has been the subject of considerable research and has been part of several exhibitions on dinosaurs. Research on Montana's T.rex and other T.rex specimens in the exhibit was accomplished and published in scientific journals by the students, staff and faculty from Montana State University. "The Montana's T.rex exhibit exemplifies an approach for presenting research results from seven different projects dealing with Tyrannosaurus rex," said Jack Horner, Regent's Professor and Curator of Paleontology for the Museum of the Rockies and Montana State University. While Montana's T.rex is not the largest or the most complete, it has some very interesting features that have been part of this research. It is the only T. rex specimen found with floating belly ribs, also known as gastralia. It is also the first specimen of its species to have the metacarpal III, on the left forelimb preserved -- that's the third finger. This discovery proved the existence of a third finger on the T. rex. About the size of an adult human pinky finger, different researchers have formed opinions on the metacarpal III ranging from it being vestigial and useless to a part of powerful forelimbs that possibly served a function such as tearing flesh. Their evidence is based on the varying conditions of the third finger, including that of "Montana's T. rex", as well as repeated fractures in the furcula, or "wishbone". Other research suggests fractures to the fingers and wishbone may have resulted from a fall and difficulties getting back up. The specimen has also been the subject of studies on parasitic infections in dinosaurs including possible bite injuries to its jawbone or diseases caused by eating rotten flesh infecting the jawbone leading to decay and the creature starving to death. 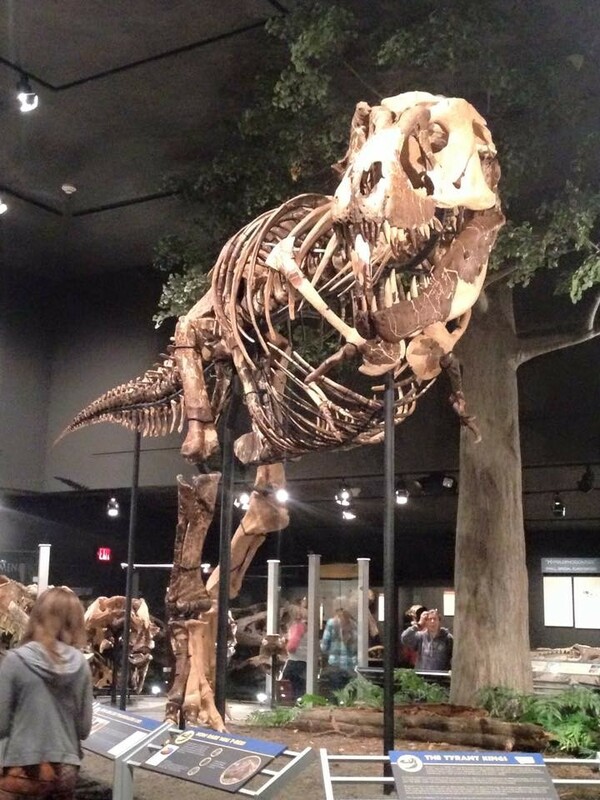 Many casts of Peck's Rex have been made and are featured at museums including the Maryland Science Center, the Fort Peck Interpretive Center and Museum (next to a life-sized model), and the Carnegie Museum of Natural History. Since 1906, Congress has passed numerous laws and regulations that recognize the importance of preserving and showcasing the nation's heritage and paleontological resources for the benefit of the American public. These laws and regulations identify nonrenewable heritage resources as significant components of the nation's history and require that they be preserved for the education and use for future generations. USACE is proud to participate in the effort to protect and preserve the nation's paleontological resources by maintaining state-of-the-art expertise in natural resource and heritage assets stewardship in support of U.S. government agencies. "Peck's Rex" or "Montana's T. Rex" as well the "Wankel T. Rex" or "Nation's T. Rex" only become available for study and public viewing when discoveries such as these that are made on federal lands are within the public trust. The value of protecting these scientifically important specimens and the need to place these discoveries in federal repositories are key to helping preserve and protect items of historical significance. 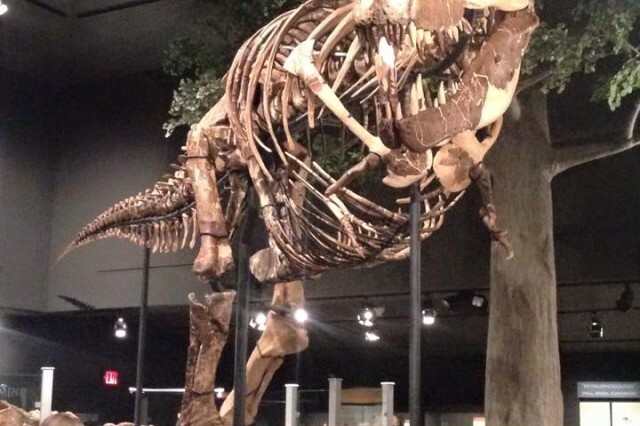 "Montana's Rex" has become the first T. rex specimen in the public trust, because it is owned by the U.S. Army Corps of Engineers, to be displayed to the public. "The Tyrant Kings" exhibit makes the Museum of the Rockies one of few museums displaying a real fossilized skeleton, which is about 60 percent complete, instead of a replica or a cast. 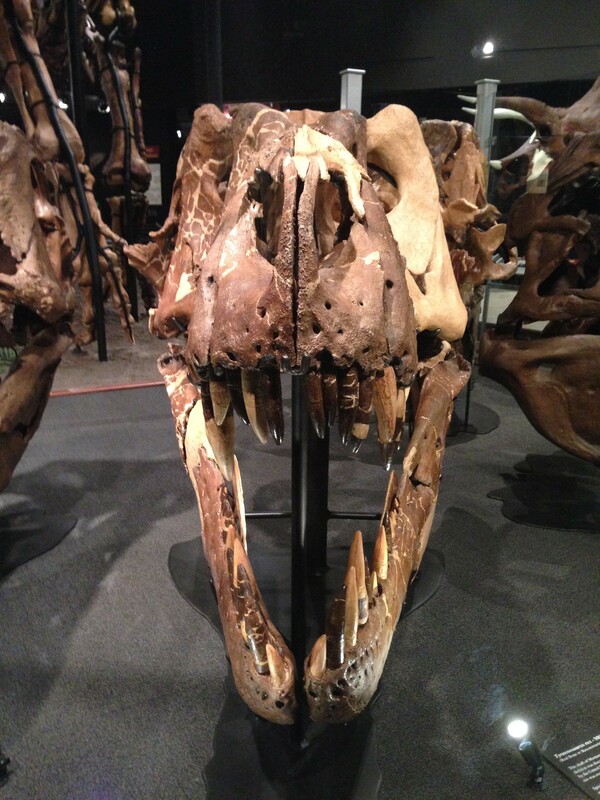 "It is the most completely mounted T.rex in the Northwestern United States," said Horner. The 40-foot-long "Montana's T.rex" is mounted on a steel frame, which allows each individual bone to be removed for study. A cast of the skull is on the mount and the real skull is in a case beneath the tail for up-close viewing.